Alex's spirited determination to raise awareness and money for all childhood cancer while she bravely fought her own deadly battle with cancer has inspired thousands of people, from all walks of life to raise money and give to her cause. Alex's family and supporters are committed to continuing her inspiring legacy through Alex's Lemonade Stand Foundation, a registered 501c3 charity. 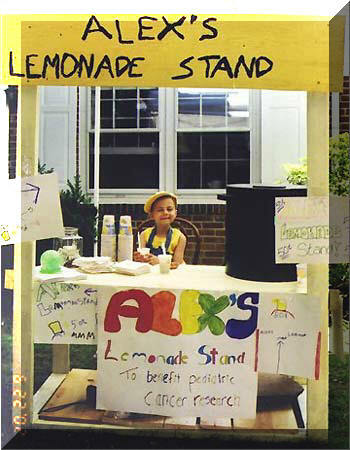 As of June 2008, Alex's Lemonade Stand Foundation has raised over $19 million for childhood cancer research. The result -- Alex's Lemonade Stand Foundation has given millions of dollars for childhood cancer research across the country! This is the trailer of the documentary, "Alex Scott: A Stand for Hope," directed by Larry Mendte. Alex Scott died of a rare form of cancer at the age of 8. But before she died she started a legacy of hope that will live on for years and years. And one day, Alex and her amazing lemonade stand may be a part of finding a cure for pediatric cancer. That is Alex's dream. You can be a part of it by going to www.Alexslemonade.com.